The KV-1E is a gift Rank III Soviet heavy tank with a battle rating of 4.3 (AB/SB) and 4.0 (RB). It was introduced in Update 1.41.27. It's basis is that of the original KV-1 model, but up-armoured with bolted appliqué armour on the front and side of the hull and turret. In game this tank possesses great armour and a mostly adequate gun, however it sometimes will not be able to destroy an enemy from the front and will require very close distance or a flank shot. The defining characteristic of this tank is its armour and it can be a tough tank to kill, most of the weak spots from its predecessors have been armoured and the only frontal weak spot is the center of the upper hull. When using this tank do not be afraid to advance towards the enemy, especially against tanks such as the 75mm M4s and T-34s since they will find it very difficult to penetrate your armour. This tank can also be used for long range support since when the armour is properly angled almost no tank that it faces can pierce its armour. Roof armour is quite excellent. 30 - 40 mm is nothing to ignore, even for heavy fighters. It will reliably protect from most autocannons. Although aircraft with good dive-ability and +30mm arms may still pierce it. More importantly it makes the vehicle quite resilient against rocket strikes from vehicles such as the Calliope. The lower glacies, unlike most other tanks, is not a weakspot! it is including your own turrets height significantly better angled than the upper frontal plate. Further neither the MG port, nor the drivers view slit are weakpoints. Discard them as targets if aiming for them. Gun mantlet is an extra 75 mm bolted on to the turret, with some parts with an extra 90 mm added instead. This results in an spaced overlapped part with ~150 mm. 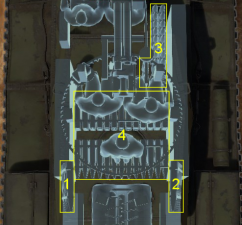 Only the cheeks left and right of the mantlet bulges should be shot! However, these areas are quite small and easily missed, if the turret is traversed. Extra armour indicated by the addition to the armour is not placed all over the tank, thus revealing some weaker areas on the front hull and sides. Urban areas tend to result in very close range engagements and at this range this tanks armour can no longer offer the degree of protection that is does at range. With this being said urban can also present nice medium range opportunists such as open air squares and long streets in which this tank can use its armour. Urban fighting presents the largest challenge for this tank as close range flank shots can easily pierce its mighty armour, as such here are some tactics to use in a city setting. Move with a group of tanks - try to stay in the middle of a group as this will minimize the chances of a close range flank shot. At this range the tanks cannon can penetrate most tanks and has a decent rate of fire, allowing it to quickly engage multiple target. Never blindly drive through a intersection - always check both ways before crossing as this presents the largest area of danger for this tank. The armour of this tank allows it to engage in the long range fighting that defines open country. However the gun on this tank does not allow it engage targets at range. this means that in open country it is a good idea to get into a good over watch position or to charge the enemy until you are capable of engaging at optimal rage for you weapon. While the armour on this tank is among the best for the enemies it faces, you will have to worry about certain tanks. 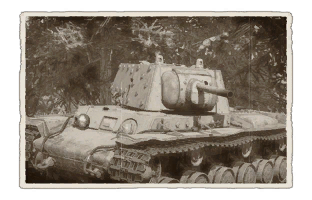 The main tanks to work about is tanks with the american 76, german 75mm L48, russian 57mm and 85mm, and of course all the large caliber guns such as the KV-2. These weapons are capable of piercing your armour at range, however this requires a lucky hit and for you to be un-angled. Here are some tips when fighting in open country. check your surrounding - while is dangerous many newer player will attempt to do this and will sometimes manage to flank you. While long range combat is not the best option for this tank it can use its armour to sit in positions that no other tank could do safely. When using this tank from long range the first advice would be to close in on the enemy however this is sometime not possible. When one finds that long range combat is necessary or is a preferred strategy, one can use place this tank in a highly visible position to draw enemy fire. This will allow teammates to find the enemy and eliminate them, it also allows for this tank to choose its target since its gun necessitates shooting at weakly armoured targets or the sides and rear of tanks. This tank excels in medium range combat due to great armour. Many tanks it faces will find penetrating this tank almost impossible even from the side, due to the additional armour. this tank does not excels due to bad mobility, and at this range the greatest strength of this tank, its great armour, is no longer as potent. Generally it is a good idea to avoid engaging the enemy armoured vehicles mentioned below frontally if possible, as they can reliably harm you and vice versa. - Pz.IV F2/G/H/J - Lethal at short ranges, shoot first. - M4A3E2 Jumbo - Shoot at sides/rear or the armour weak spot above the gun-mantlet or Hull MG.
- T14 - Shoot at the hull MG port + sides/rear. - Churchill MK. III/MK. VII - Hull at the MG port + sides/rear. - ARL-44 - Difficult to engage frontally, shoot sides/rear. Great armour protection on all sides. Weak spots like the flat sides are much better protected. Acceleration is good on flat terrain. Angling your hull makes the frontal armour immune to most guns it faces. Gun does a lot of damage upon penetration. Heavily armoured for a Rank II tank, even compared to original KV-1. Crew of five allow for higher survivability. Reload rate is decent for the cannon. Additional weight hampers the tanks already poor performance. F-32 gun is same as L-11 in penetration, very bad for dealing with other vehicles it may face. Slow turret traverse, if you need to change target quickly you must rotate both the turret and the hull. Making turns will decrease your speed dramatically. Climbing hills is very sluggish for the tank. Can encounter other armoured fighting vehicles that are able to easily penetrate its armour, such as the Panzer IV F2. Large fuel tanks lined up on the side. The initial production in 1939 had the KV-1 equipped with an L-11 cannon, this was upgraded to the F-32 in 1940. The Model 1940 production was the main KV-1 variant that was available during the German invasion in Operation Barbarossa. During the German invasion, it was found that the KV-1s, while invulnerable to even the German Panzer IIIs and Panzer IVs, was easily taken out by the German 88 mm FlaK cannon used in anti-tank roles. This caused the KV-1 production model to be up-armoured for increased survivability with applique armour bolted onto the tank. 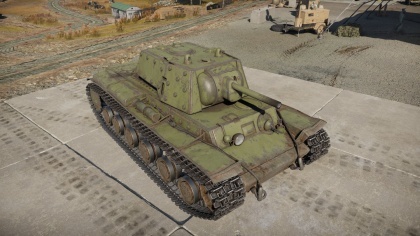 Though it varies on how much extra armour is bolted on, some KV-1s have overall armour width of 100 mm thick. These up-armoured Model 1940 KV-1s were called KV-1E, with "E" standing for "ekranami ", which means "with shields". This up-armouring of the tank caused the weight to be increased from its original 45 tons to 50 tons, further straining the drive system of the tank. The main bulk of these up-armoured tanks was sent to the Northwestern and Leningrad fronts. Some of these tanks were captured intact and used by German forces against their former users. Nevertheless, the KV-1 continued to serve until the end of the war, though in dwindling numbers as they are lost due to mechanical failures or combat. Some 1941-built KV-1s still saw service in 1944 at the Leningrad front before being replaced by IS-2 tanks, then they saw service in Manchuria in 1945. Several KV-1s survive after the war, most as monuments, but also in museums. Only one genuine KV-1 was restored to running condition in Russia after it was found in the bottom of the Neva River. One KV-1B can also be found at the Bovington Tank Museum at England. This page was last edited on 14 March 2019, at 21:07.